Nut milk makes an excellent substitute for cow's milk in case a person is a lactose intolerant, a vegan or fancies a change. Almond milk has become a favourite of people as it is considered healthier than cow milk in some cases. It has many beneficial properties like the absence of added sugar, chemicals and low carbohydrate content which is excellent for controlling blood sugar. It promotes a healthy heart and instils a feeling of fullness because of its high content of good fat. In comparison to cow milk, The fat and salt content in nut milk are virtually alike in comparison to cow's milk. Even though cow's milk has more protein, it's still too little to affect your diet. 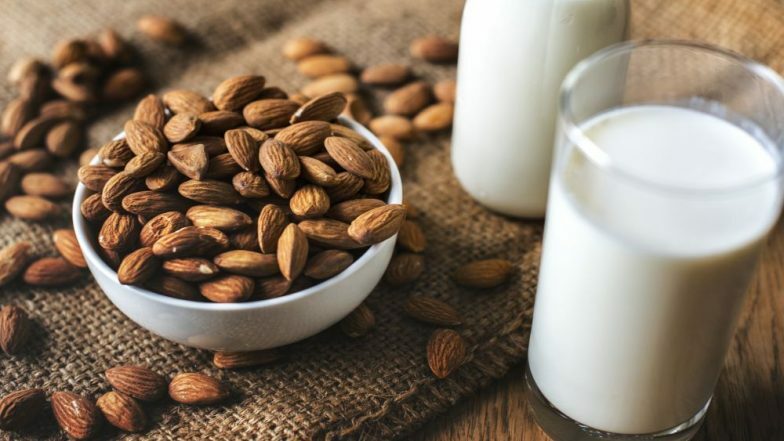 Along with being suitable for people who are lactose intolerant, almond milk is somewhat healthier because it comprises of vitamin D, which is absent in cow's milk. To make the perfect almond milk at home, all you would require is water, a cup of nuts and a blender. National Milk Day 2018: Almond Milk, Quinoa Milk+ 4 Other Healthy Non-Dairy Substitute of Milk for Lactose Intolerants and Vegans. 3. Put it into a blender add 4 cups of water and make a smooth paste. 5. Strain the milk into a sealed bottle and keep it in the fridge where it’ll remain for 3 to 4 days. Any nuts such as Almonds, Hazelnuts, Macadamias, Peanuts, Pine nuts, Pecans, Walnuts, Cashews, Pistachios, Brazil nut etc. can be used in case a person is not a big fan of almonds or wants to try out milk made of other nuts.